No Starch Press recently released a new book in the making space. This latest entry, titled Arduino Project Handbook by Mark Geddes, joins the many existing Arduino books on the market. Over the past few weeks I have been reading the book and making some of the projects. The book has a wealth of knowledge to share. Overall, I really liked the book. I do want to get my one main complaint out of the way now. Based on the title and description, I was expecting a book of projects from start to finish. This book only goes as far as the breadboard. I was expecting projects to have enclosures and mounting of elections, a mixed-media problem faced by many new makers. However, none of the projects make it that far. Sample page, used with permission from No Starch Press. Once I adjusted my expectations, I really got into the book. Most projects are presented with some pictures and then a wiring schematic. You can see that in the sample page to the right or below. The wiring schematic uses symbols that closely match what the actual part looks like, instead of the traditional electronics schematic. This is really helpful for new makers. From both the wiring schematic and the pictures it is really easy to make sure you wired your project correctly. All of the projects, save the last few, use the Arduino Uno. The last few projects do not use the Uno, rather using the ATMEGA328 on a breadboard. While still using the Arduino firmware, this is a good way for makers to condense the number of boards in a project. The projects are creative and fun, ranging from blinking lights to a weather station. Some projects require just a few parts while others are a bit more complex. Many of the individual skills are easily applied to other projects. For example, several projects use an LCD screen or servo motors, two of the most common devices in maker projects. Furthermore, the sample code is clearly commented and published in the book. This is huge as many publishers are moving this content online, making it harder to follow. I found this helpful when working on my desk when my internet went down. I was able to keep tinkering and following the instructions without having to worry about reaching the publisher’s website. Overall this is another great Arduino book. Mark Geddes does a great job of showing how new makers can leverage an Arduino. I recommend the Arduino Project Handbook for any aspiring makers and those new to electronics! You can find the book on amazon for under $20. For that price, I think it would be a great addition to any maker’s library! These came in a while ago, but with all the travel this fall, I have been behind in my posting. I wanted to get share my review before the holiday season started as these are certainly must-haves for any LEGO Technic builder! Before we dig into the books, let’s talk about the author, Yoshihito Isogawa. Yoshihito is one of the best Technic/MINDSTORMS builders out there. He hosts countless workshops in Japan and is always creating! What is so cool is that his creations can be used in so many different projects! They really are a great starting point. I highly recommend his LEGO MINDSTORMS EV3 Idea Book. Now let’s talk about the LEGO Power Functions Idea Book Volume 1: Machines and Mechanisms. The first volume’s focus on machines is spot on! 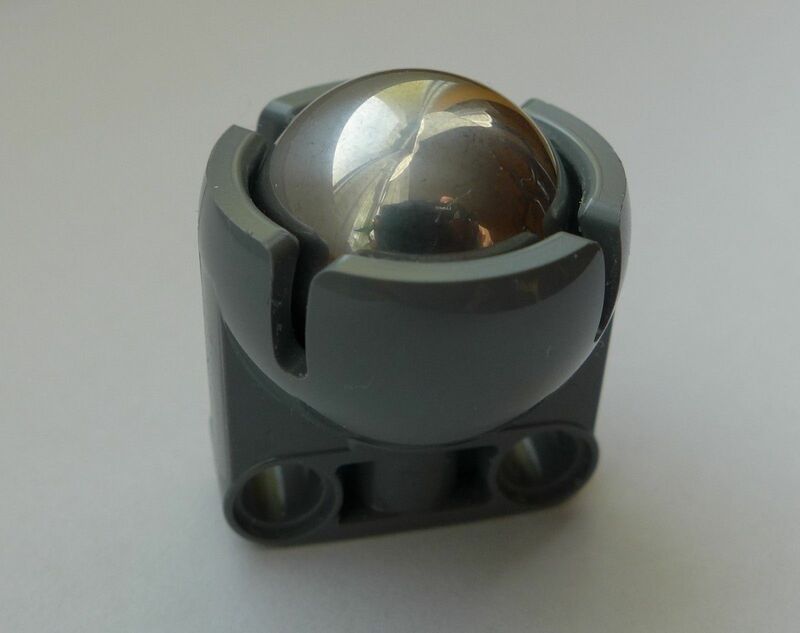 Many of the modules, for lack of a better term, are innovative ways to mount LEGO Power Functions motors and transfer power in a useful way. As you can see from the example page, there quick little projects provide lots of photos and a bill of materials. While the book does not give you step-by-step instructions, much of the design is easy to figure out. More on that later. The various machines Yoshihito provide lots of attachment points. I spent a few hours building some of the mechanisms from his book. I learned some good building techniques and I can really see myself using them in upcoming projects. LEGO Power Functions Idea Book Volume 2: Cars and Contraptions is probably the more useful book for me. Many of the robots I build move. Cars and Contraptions shows some really unique drivetrains. These ideas would be super useful for FIRST LEGO League teams. I rarely uses LEGO Power Functions in my drivetrains. These ideas will certainly change that. The beauty of LEGO Power Functions is that it super easy to integrate into a robot. While the motors are not encoded, they do provide a lot of power in a small package. These presents a unique design challenge and something that I am looking really forward to exploring. My favorite part of this book is that it doesn’t give the entire design. So many of us are attached to building instructions. I love idea of just sharing pictures and letting others build off that idea. Yoshihito does exactly that. I found myself having to improvise when I couldn’t quite figure out how to make something or lacking a part. This was great fun and just added to the enjoyment from these books. The various models are simple enough that you get by with just photos, but yet also open ended so that is room to make your own take on everything! I would highly suggest this approach for anyone who feels that step-by-step instructions are too simple, but not quite ready to create from scratch. Long story short, I would highly suggest both of these books and they should make it on to any holiday shopping list! Yoshihito is an amazing LEGO builder and it is truly a gift that he is sharing these ideas with the global LEGO community! 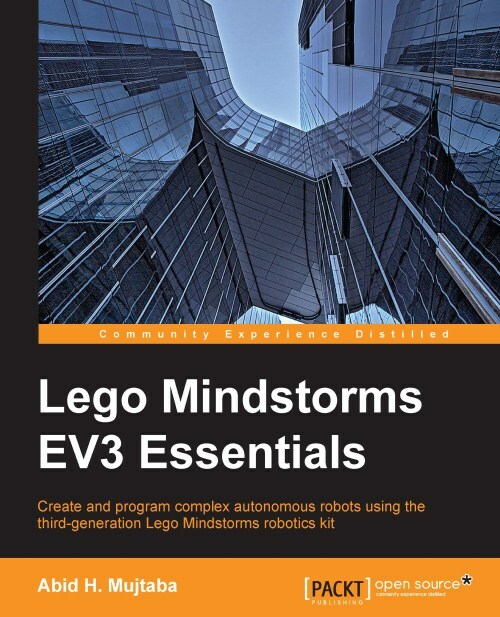 LEGO MINDSTORMS EV3 Essentials by Abid H. Mujtaba in a new offering from PACKT Publishing. I was able to review the ebook over the last couple weeks. PACKT did a good job in publishing the book in color. The book presents the EV3 in great details. It goes over each sensor and motor and includes comments on using NXT electronics with EV3. However, some of the images used were out of focus or looked cropped. The screen captures of the EV3 screen were good quality, which is key to understanding what is going one. That said, if you want a summary of EV3 hardware, there are better books out there. You might consider another option. Where this book really shined (albeit a bit unusual approach, by not actually talking about some of the really cool tools of leJOS) is that it provided an overview of Java leJOS on EV3. It goes over some basic Linux settings (wifi among other things) on the brick. It goes over IDEs and Makefiles. The book provides some good sample programs to get you started. It sort of assumes you have some exposure to Java and Linux, but not much on MINDSTORMS. Overall I would recommend this book if you want to do Java on EV3 and have some Linux exposure. However, there is some room for improvement. Naturally, it is LEGO and MINDSTORMS, not Lego nor Mindstorms. Lastly, leJOS has some impressive tools out of the box that seem to be ignored. Programming can be some of the most difficult and most exciting parts of working with LEGO MINDSTORMS. Seeing a creation come to life can simply be magical (#mindstormsmagic), but is a daunting task for many. With a slew of books on the market for EV3, few focus almost completely on programming. The Art of LEGO MINDSTORMS EV3 Programming by Terry Griffin does a good job of making programming something anyone can do. The author guides you though building a basic bot and programming it to complete various tasks. These range from things like line following and navigation. Griffin also goes over sensors in both the education and retail kits of EV3, making it a good resource for just about anyone. Like any good MINDSTORMS reference, there is good discussion on each sensor and how that relates to programming. Griffin also discusses each programming block in good details. This helps create the logical links for any new programmer. One of the unique parts of the book is how practical it is. Most books present turnkey bots and programs. This does wonders for getting you started, but might not be as much help in the classroom or on your FIRST LEGO League team. The author walks the reader through the process of experimenting with some of the basic sensor views as you can see in the picture, left. These sorts of skills work well there is no one correct solution to the challenge. Overall I was really impressed with the book. My only criticism is that it very much revolves around one robot. Sometimes how you use a sensor in software varies on physical construction of the bot. Take my latest bot Creep3r for example. While I use the IR and touch sensors in a straight forward way, the use of the color sensors detecting the doors and acting as part of the explosion is quite unique. It makes for a slightly more complex program, but makes the bot more exciting. That said, when you begin to use sensors in more unique ways such as sensing internal robot functions instead of the environment, that is a bit more complex. I would say this is a very minor drawback of the book, but would certainly be an exciting topic for a future book to explore. Hands downs this is one of the best programming references on the market. I would say that The Art of LEGO MINDSTORMS EV3 Programming is a must have for anyone who is getting starting creating robots. Couple this book with The LEGO MINDSTORMS EV3 Discovery Book and you have an excellent set of references for any new EV3 owner! A few weeks at Maker Faire I met Eun Jung (EJ) Park and I was asked to review her latest book Exploring LEGO MINDSTORMS EV3 Tools and Techniques for Building and Programming Robots. I spent the past few weeks (between trips) reading the book and thought I might share my review. Exploring LEGO MINDSTORMS EV3 Tools and Techniques for Building and Programming Robots is a fun book. I love the various bots. Animals have always been popular in the MINDSTORMS community and this books introduces a bunny (as seen on the cover), a turtle, and a couple others. Each has their own special attribute and it is certainly fun to bring them to life! As I said, Park does an excellent job of creating fun robots, but these are more complex to build. There are two things that make these bots more difficult. The first is lack of color images, but I will touch on that later. The second is that use new building techniques and more parts than many other models. I see this as a good and a bad. If you make it though building each bot in the EV3 software, then it is certainly something you would enjoy. You will learn some new ways to construct bots. Best of all, you will create a robot that is just cool to play with. 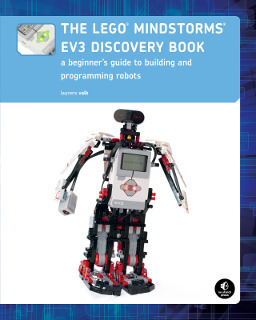 If you are picking up this book before building an EV3 bot, then you might have some trouble. Where Park really shines is in the programming. This book is more technical: how to use motors and sensors. Park goes into great detail on programming walks you through creating some very cool code. Aside from the black and white images, the programming and explanation is pretty easy to follow. Park does a good job of creating a bot that is exciting and fun to program, but still leaves it open ended to add more. The detail given to how the various motors and sensors function, make this an excellent reference for anyone new to MINDSTORMS. Exploring LEGO MINDSTORMS EV3 Tools and Techniques for Building and Programming Robots is a bit strange in that I loved the content, but hated the physical book. To put it simply, the physical book is in black and white. This makes following along (especially building instructions) extremely difficult. The lack of color images probably has less of an effect on the programming images, but it would still make the programming a bit easier to follow. A color version of this book would go a long way and enable the author to do so much more. Hopefully Wiley will release one in the future as it is the most glaring handicap on an otherwise great book. Overall I would recommend this book for the programming guidance, but until Wiley releases a color version (maybe in an ebook?) I wouldn’t suggest this for first time builders. If you have been around MINDSTORMS a bit and looking to expand knowledge in programming, then this might be a good book for you. This book review has taken me longer than usual. I have had a copy of this book for a while now, but I literally just finished it. The reason is not what you might expect. To put it simply, I got caught up in the book. I cant recommend this book enough. Laurens Valk did it again! The LEGO MINDSTORMS EV3 Discovery Book is an essential book for both new and old MINDSTORMS builder alike! First off, the print quality off the book is excellent and this is key. As I spent hours building and referencing the diagrams in the book, it was helpful to have full color and high resolution images. As any LEGO builder knows, some parts are hard to see and the high quality images, coupled with Laurens’s excellent building instructions made constructing each bot a breeze. If you have read any of Laurens’s other books, some of the bots might seem familiar. (SNATCH3R for example) EV3 is an awesome new platform and seeing the bots upgraded to take advantage of all the updates. Laurens has bots for everyone, from cars to bugs. Each bot is an extreme joy to construct and program. The book provides excellent programming instructions to get you started, but like any LEGO set, the true excitement comes from building on that idea. For each bot, there were countless moments of “oh I bet I could made it do that!”. For example, I added a marker and had it drawing shapes on the floor (and then had SNATCH3R following the line!). For the seasoned LEGO MINDSTORMS Builder, there are excellent diagram on showing how to build with Technic. This would be super useful for teachers and FIRST LEGO League students. One of the most innovative things Laurens presents is the use of graph paper with LEGO. As you can see in the image left, the grid really works well for figuring out angles and layout bot designs. This makes building complex mechanical designs or even super large robots significantly easier. Laurens uses this technique for more than just triangles, but you will need to get the book to see those! In case it wasn’t clear by this point, I have really enjoyed this book. The book is a few hundred pages of LEGO MINDSTORMS awesome. I have been building robots with LEGO MINDSTORMS for well over a decade and a half and yet I still learned new techniques from The LEGO MINDSTORMS EV3 Discovery Book. I cannot recommend this book enough. Every LEGO MINDSTORMS builder will find something they enjoy in this book. Don’t be surprised if you spend countless hours building, programming, and playing. It is an excellent reference that I am sure you will be visiting multiple times. In fact, this book hasn’t made it to my shelf yet. I think it might have a permanent home on my desk. Play well! Another trip, another book (and a bonus deal)! Remember that Maker Faire Demo and all that image processing? I relied heavily on the Image Processing Toolbox in MATLAB and I thought I would share a good resource I came across. Overall I really liked the book. It is a great reference and a good way to get start in MATLAB. You can find it on amazon or though the publisher. Speaking of which, that bonus deal I mentioned… Packet Publishing is having a holiday sale. You can click the banner below or follow this link. The deal is $5 for any ebook or video from packet now (December 19th) though January 3rd. A few of the books I have review come from Packet, so it might be a good way to pick up some books for the new year on the cheap! On my return trip from Denver, I enjoyed another book. 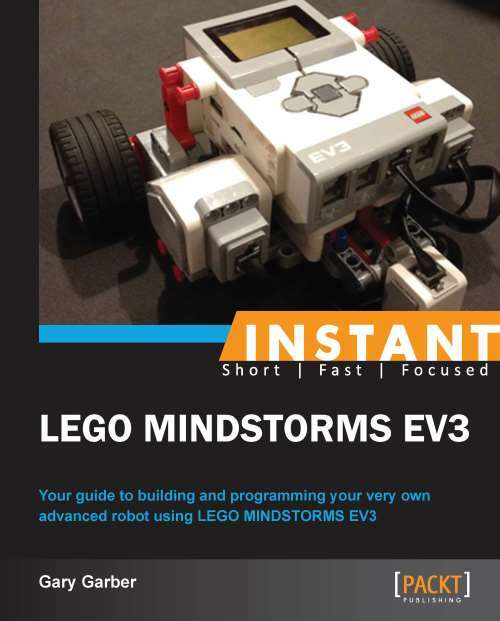 Instant LEGO MINDSTORMS EV3 by Gary Garber is a quick read to get you up and going with the latest LEGO MINDSTORMS set. As you have seen in some of my previous posts, I do a lot with EV3 and I love sharing good resources for building robots. Instant LEGO MINDSTORMS EV3 is a great introduction to the educational version of the EV3. The book is great for teachers who are looking to integrate robotics into their classroom. Topics range from building a simple robot, to creating a proportional line follower. Garber refers to the various segments of the book as ‘recipes’ and that really is a good name for them. Each section breaks down into steps, along with CAD renderings or screenshots. This makes for a good tutorial as it is easy to follow. Be it good or bad, you don’t need to read most of the book. The images are that good and easy to follow. I would recommend this book for anyone, but with the focus on the educational kit, it is really best suited for teachers (or students who have access to an educational kit at school). 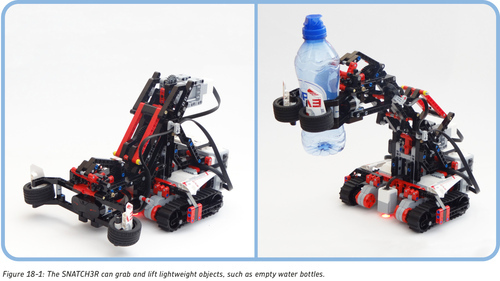 Unlike the LEGO MINDSTORMS NXT, EV3’s educational kit is quite different from the retail kit. The educational kit contains different sensors (ultrasonic instead of IR, no IR remote, and a gyro sensor), software (the educational software directly supports these sensor differences and includes data logging), and finally different parts (most notably the caster ball, pictured right). One interesting surprise with this book is that I actually know one of the technical reviews. Chris Rogers, a professor at Tufts University and director of the Center for Engineering Education Outreach (CEEO). Chris and I had worked on some NXT projects (mainly involving my RS485 work). We seem to keep crossing paths. Naturally, with technical reviews like Chris, and the detailed recipes, Instant LEGO MINDSTORMS EV3 is a good book. While it does not go into to all the various ideas or projects that most other MINDSTORMS references include, it does a fine job of getting you up and going quickly. If you are looking for a quick read (under 100 pages!) or are like me and feel the need to read everything related to LEGO MINDSTORMS, you can find this book of amazon.com or from the publisher. As some of my readers know, I am in Denver at SuperComputing ’13. It has been a crazy week, but traveling also affords me some time to sit back and read. On the flight over I finished reading Getting Started with Simulink by Luca Zamboni. Overall this is a very good introductory book into Simulink, but it does require some mathematical background to truly understand what the author is doing. Like LabVIEW, Simulink is a graphical dataflow environment and requires very little text code. For many, this approach to programming can be quite easy and improve productivity; however you need to understand how datalfow works. The author begins with a simple cruise control model that leverages a PI controller (more on that later). Like many systems that interact with the physical world, it maps well to dataflow. The author does an excellent job of stepping you through construction and testing of the model. He even mentions some good shortcuts (like how to reset the zoom, a shortcut that I learned while reading this book). Like any good tutorial, the Getting Started with Simulink builds on previous examples. Once you complete the first example, you build a model for a car. This exposes the user to simulation, one of the key advantages of Simulink. The book builds quickly and at first it seems like Zamboni is throwing everything but the kitchen sink at you. He really does challenge you, but Zamboni is there to step you through each step of building the model. From creating subsystems for for motors to simulating drag. The model is a very complete representation of a sports car and by the end you feel very accomplished. Best of all, you have actually mastered most of the skills required for Simulink. I would say this book covered 90% or more of the blocks that I commonly use. Another key aspect of the book is that it uses an up-to-date version of MATLAB and Simulink (2013a). While the basic concepts don’t change with time, features are sometimes tweaked or new file types supported. Zamboni does a great job of pointing out many of these minor differences. He really is an expert in the software. Now about math and that PI controller. Well to be honest, the PI controller was just the first math-heavy aspect of the book. The model for the car does get kind of math heavy, but that is very much the nature if many models. While you don’t actually need to understand the math to follow along and complete the models, but it certainly helps. If you’re an engineer or engineering student, then chances are you know physics and calculus. For my non-engineering readers, don’t feel like this is a deal breaker. The author does explain what is going on, but probably not in the detail that you would like. One other thing to keep in mind is that this book requires no hardware (no MINDSTORMS, no camera, no motors, nothing). So if you plan on interacting beyond simulation (given simulation is one of the big features of Simulink), you will have a bit more learning to do on your own. Personally, I think you should start in simulation, and once you master that, move to hardware. Overall I would recommend this book to any reader. I know there are quite a few people out there that are just getting started with MATLAB and Simulink for LEGO MINDSTORMS. This is a great first step in mastering the environment. The book is available on amazon or directly from the publisher. The book also is available in ebook form for your tablet or Kindle.